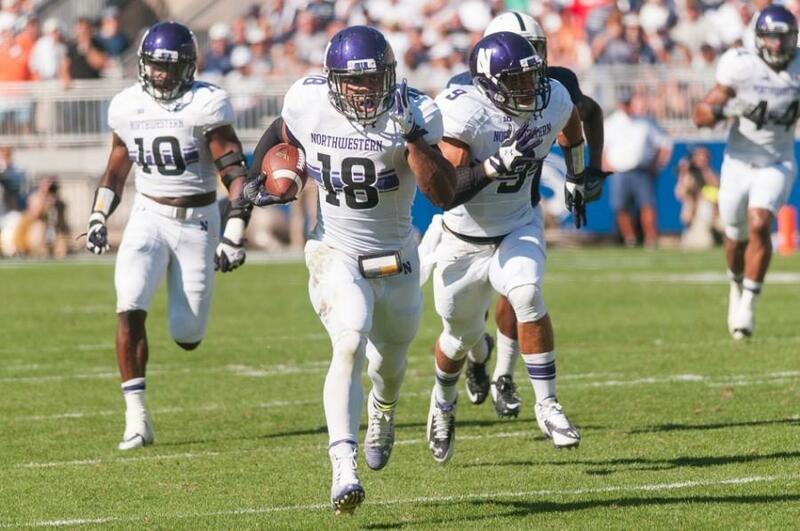 Anthony Walker (18) runs back an interception in last year's win over Penn State. Walker leads an inexperienced group of linebackers in 2015. Northwestern started the season with an all-star crew featuring Collin Ellis, Chi Chi Ariguzo, Drew Smith and Jimmy Hall, a group of linebackers that was the backbone of the defense that carried a disappointing offense to a 5-7 season. Ariguzo, now in training camp with the NFL’s San Diego Chargers, finished as the Wildcats’ leading tackler with 104 stops. Hall, now with the Oakland Raiders, and Smith, a senior, rotated at the SAM linebacker spot and combined for two interceptions and 10 tackles for loss. After Ellis began experiencing concussion issues early in the season and eventually retired, sophomore Anthony Walker stepped in brilliantly at the middle linebacker position. The Wildcats operate out of a base 4-3 set and occasionally turn to a nickel 4-2-5 sub-package, with the SAM linebacker dropping back in coverage as a safety. In 2014, NU took full advantage of its sub-package, using Smith as the primary run-stopper and subbing Hall in for passing situations. In 2015 this will not be as much of an option because of Hall’s departure and the other linebackers’ lack of experience. With Ariguzo, Hall and Ellis all gone, the Cats will heavily rely upon Walker in the middle to lead the less seasoned players as well as the whole defense. Fortunately, Walker tends to handle pressure well. In his debut last year against Penn State, he made eight tackles and returned an interception for a touchdown in an improbable road win over the Nittany Lions. This year is not only critical for Walker — Smith also takes on the new challenge of potentially being a full-time starter. He made just seven starts last season and spent two years as a rotation backup before that, but with the depth chart behind him lacking in experience, Smith may now have the full trust of the coaching staff. The SAM linebacker position opposite him is more of an open battle. Coach Pat Fitzgerald said junior Jaylen Prater is currently practicing with the first team but that junior Joseph Jones and sophomore Brett Walsh are also in the mix. Prater, Jones and Walsh have all yet to see meaningful action in their careers, but Fitzgerald said he was impressed with the group in the spring. The middle linebacker is sometimes called the quarterback of the defense, and it will be up to Walker to lead an otherwise inexperience group. Ranked as the No. 71 outside linebacker in his recruiting class, according to ESPN, Walker will need to fulfill that potential and anchor the defense with his athleticism and game understanding.